Sometimes during the cooler months, I make dishes that transport me away from where I am and into a warm, sunny place. I nearly always have a jar of kalamata olives, artichokes, and roasted red peppers in the refrigerator for salads and sandwiches. 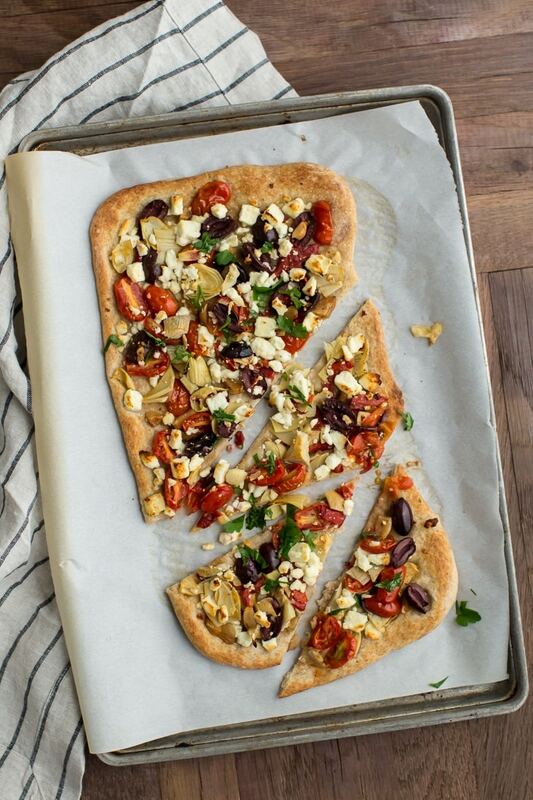 This flatbread is the perfect dinner for M and I, accompanied with a salad. If I don’t feel like making the dough ahead of time, I’ll pick up the pre-made whole-wheat dough at Whole Foods or Trader Joe’s (perfect for those ‘I didn’t have time to make dough but I still want homemade flatbread)! This looks so lovely! I love how simple and fresh the topping are! Wishing you a happy new year Erin! Yummm!! This looks sooo good. So colorful, pleasing to the eye and good for you.. I can’t wait to try this one. This looks wildly delicious!! Love those flavours!! This looks delicious! I have been on a major cookie kick lately and this is just the thing I need to get back to vegetables and nutrients. I love the simplicity of the recipe – it makes it just a little bit easier to start eating healthier. What wonderful colours and it sounds so yummy! This looks so good!! Totally have to try it sometime! Your blog is looking super smart and fresh with the re-design. And I see you have a new book in the works! Congrats! I made this tonight using the pizza crust recipe from your Brussels Sprout and Meyer Lemon pizza. It was great. It would be helpful if you’d include a link to the dough recipe for those who want to make it. Thanks for the yummy recipe! 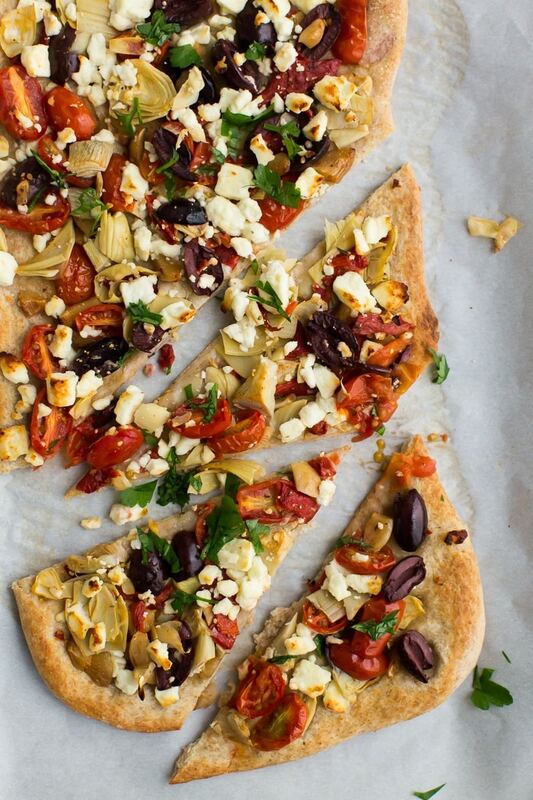 Great topping idea for a cauliflower pizza base too! I’d like to make the crust from scratch. What recipe is best? 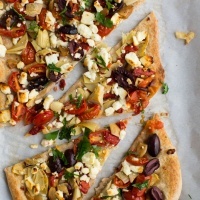 love mediterranean anything (mostly) and love this on flatbread, love how all of these ingredients seem to meld together and seem so well chosen, love the lime juice for instance, thank you for this recipe! This was wonderful! I did chop the olives a bit, but they give the right amount of saltiness to the pizza. Next time, I would roast the tomatoes ahead of time, just so I could make my crust a little less crispy!